Unlike wind, water and frost damage to gravestone monuments, it is not so greatly influenced by the type of stone. It is however related to the location and direction the monument is facing as well as the amount of pollution in the air. Moss is most likely to be a problem in the more shaded parts of a cemetery especially where the monument is facing north. It is more common in rural cemeteries where there is little pollution. Lichen damage is much more likely on older stones as it is much slower growing than moss. It is also more likely in rural churchyards where there is little pollution. In town cemeteries where there will be more pollution, lichen is not such a problem as the pollution kills it off before it can do any real damage. 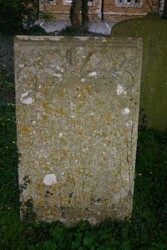 Removal of lichen can actually result in more damage to the monument. This is because small holes will be left into which water will penetrate and in cold weather produce frost damage.